Each year NetEnt releases a new Christmas themed slot game. Last year this was Secret of Christmas. This year the game is Jingle Spin. 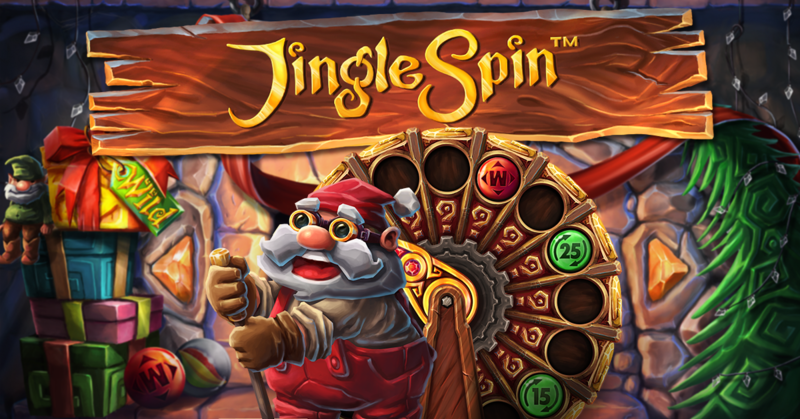 Jingle Spin is not a new slot game, in fact it’s an exact clone of an older NetEnt slot game, Eggomatic. But now, of course, with a Christmas theme. Jingle Spin uses 20 lines and comes with wild symbols on all reels. During each spin Santa can add a special symbol above the reels. This symbol will move the left after each spin, until it moves off the screen. When a wild symbol on the reels alligns with one of these symbols above you will receive the attached bonus. If you already know Eggomatic, this game will be nothing new, except for the theme. If you never heard of Eggomatic, those players can now enjoy this pretty cool slot game with unique bonuses. And I have to say that this new version does seem to play a lot smoother. Eggomatic was sometimes problematic in the past, but to be honest, I haven’t played it in a while, so maybe they updated it lately? If you are looking for a very nice looking Christmas slot game with a really cool bonus feature, be sure to check this one out now at any top NetEnt casino.